Artist Series "Cameo" designed by Sheri Rhodes. 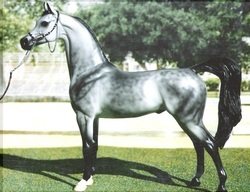 Shown as a gelding. Versatility Award and ROM in halter from NAMSHA. Chiropractic Emergency, "Flick" from 2007 Rocky Mountain Rendezvous, a chestnut overo factory customized english style pony. Signed by his owner, Teresa Buzzell. Obtained at the event and named because his back is quite out of alignment from the customizing done at the factory. I haven't come up with a better name yet, so it's stuck. Traveling Man, a MTA Make My Day or "Clint" SR from 2000 Stone Country Fair. He's an ISH in a bay tobiano pinto with a roan spot at the top of one leg, long mane and short tail. He was obtained at that event.